Please fill out the request form with as much information as you can. If you don’t have the time to fill out the entire form, or you are using a mobile device and want to fill out a shorter request form, go here (Standard Contact Form). Or you can always email us direct at sales@web7marketing.com. Or simply call our sales & research department directly at 248-507-4420. Note: If you would like to submit a pre-made RFQ please email the RFQ in a PDF or MS Word format to sales@web7marketing.com. Thank you. How large is the website? How involved do you want to be in the development? I want Web 7 to handle everything. Do you need a Content Management System (CMS)? Do you need website marketing? Do you need email set up? Do you have Office365 for email? Do you need custom programming? Do you want Search Engine Optimization (SEO)? If you want SEO, what level? Enter a time between 6am and 9pm. There are numerous ways to develop a website, each with specific design points and development costs. Knowing a general budget allows us to make design & SEO recommendations so you get the most for your money. We always try to work within a budget, and in most cases we stay well below. I needed this up yesterday! If you have additional information you feel is necessary to share, please add it below. We will contact you by the close of business today, or we will call you at the best time you requested. 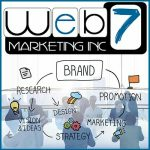 Thank you for considering Web 7 Marketing Inc.
Website Design, SEO & Marketing for Small Business.